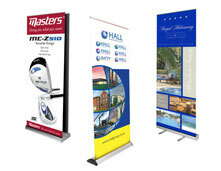 We have a wide range of promotional banner and vinyl solutions to meet our customer needs. Whether it is a banner for an outdoor/indoor event, a hanging banner, or maybe an exhibition our banner signs are perfect for promotional events where you need to have a portable sign that is eye catching but also rugged so that it can be used again and again. All of our banners are printed in-house using the latest digital printing technologies. 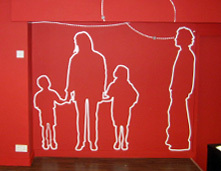 You may also have need of vinyl lettering which can be applied to glass or can in fact be put on to any solid surface. Having been made from quality vinyl and coming in numerous colours and styles your options are endless for producing signage for your company or vehicle. The same applies to the stickers and decals we produce which are made using the latest computer technology to make sure they are at the cutting edge of design and style. 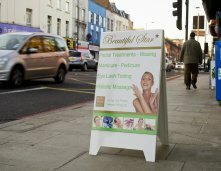 A Boards are a great way to get custom through the door of any shop or business. Metal “A” Boards are robust, durable and weatherproof. These quality products are ideal for use in roadside promotion, point of sale, forecourt signage, exhibitions and much more. Banner stands are an instant promotional display and one of the most cost effective methods of communicating your brand or message in a professional yet cost effective way. Custom stickers and printed decals make affordable advertising tools. They can be used to promote an event, can be used to provide temporary signage within an office or work environment and can be used for health and safety purposes, including fire safety and emergency exit provision, as well as numerous other uses.